Barack Obama Sr. used to hang out with former Gov. Neil Abercrombie at the old Kuhio Grill in Moiliili when they were both students at the University of Hawaii around 1960. 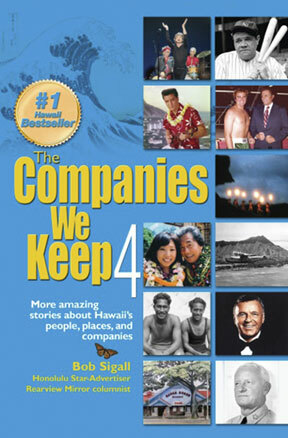 KHON News Anchor Joe Moore was mentored by Jack Lord on Hawaii Five-0. When James MacArthur retired after 11 seasons, Lord ask Moore to come aboard. “It was an offer I couldn’t refuse, but did,” Moore recalls. The Beamer Brothers and comedy group Booga Booga both got their start at the Territorial Tavern downtown. Ferdinand Marcos trided to launch a counter-revolution against the government of the Philippines but failed to even get it off the ground on Lagoon Drive. Local DJ’s Ron Jacobs and Tom Moffatt’s Roller Derby stunt at the Civic Auditorium led to their meeting Elvis Presley and MC’ing his first concerts in Honolulu. How reporters Linda Coble and Kirk Matthews were driving into Waikiki one day in her new Mustang Convertible, and were directed into a line of traffic. Too late, they discovered they were stuck in a parade down Kalakaua. Half way into it, waving all the way, they found it was a Gay Pride parade!